Check out the For paws blog for training tips, tricks and stories that will help you and your dog live the best lives possible. Why puppy school is just the start! Puppy school is great! A good class will help you get to grips with training essentials, it will set your pup for well managed socialisation and of course you’ll have some fun along the way. But, what comes next? 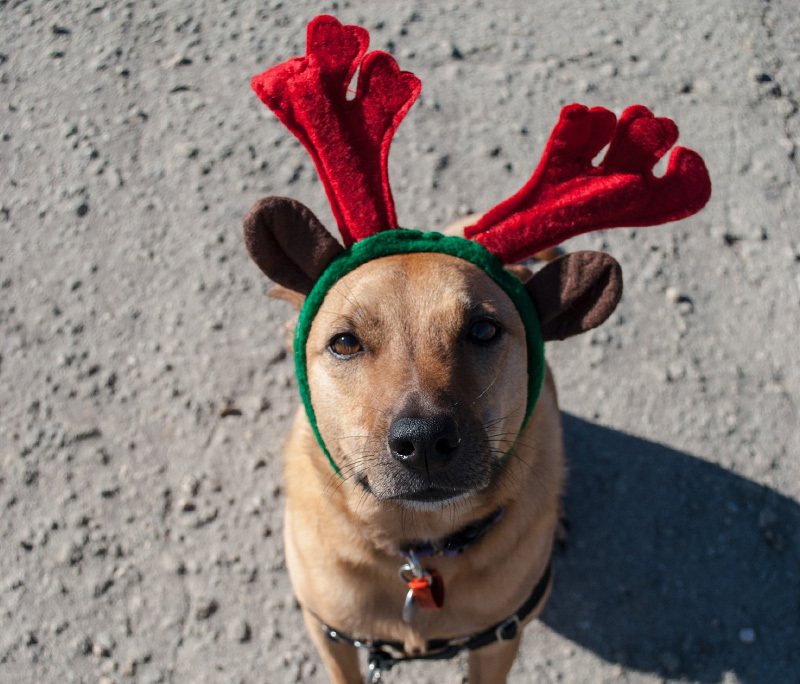 Make your dog’s Christmas Merry, learn what they really enjoy! Learning what your dog really enjoys isn't as easy as it sounds. But, with Christmas round the corner and a bit of spare holiday time up your sleeves, here are a few tips to try out. As everyone knows, dogs will do what works or what they think will work for them, so whenever possible make sure that what works is something that you are happy with them doing too. Be proactive when training your dog! It is important that our dogs are able to focus on us and it is fundamental to our relationship that they can fit into our environment and activities to at least some degree. But what about fitting into theirs? Small things can make a big difference to how your dog responds to training and something as simple as an odd smell or even a foggy day can be the difference between a positive training experience and a negative one. But, you can overcome these situations. Trick training isn't just cute, it's also a vital part of bonding with and training your dog. Several months ago at one of our regular walking spots we came across a lovely, although very boisterous, pup. It was clearly playful and keen to interact with our dog and, as we got closer, it started trying to pull towards us. At this point the owner violently jerked the leash several times, the pup was wearing a prong collar. Over the next few months we witnessed this same process every time the pup crossed paths with another dog. It’s holiday time! There’ll be parties, shindigs and hootenannies; a relative will drink too much, a different relative will eat too much, other relatives will argue and the much smaller relatives will stay up past their bed time and enjoy unprecedented freedom. But what about the dog? Whether it’s a dog that’s been in the family for years, a dog visiting from another family or even a new doggy addition, there are some things we all need to remember about those smaller relatives and how they interact with the beloved dog. “No” seems like a pretty harmless word, after all it’s in human nature to say it when we don’t want something to happen. But what does “no” mean to a dog? The short answer is nothing. Until we give it meaning. Watching Lola work her way through life and now watching Evie experiencing the big wide world has really driven home to us how much Lola struggled on a daily basis with basic doggie behaviours and what we perceive is ‘normal’ for them. It has been a while since I have felt able to write anything relating to our beautiful dog Lola. Losing her has been one of the hardest things I have ever had to experience and we miss her every day. Finally, every experience you have, whether it be good or bad is something that you can learn from. Once things have calmed down you need to go over what happened and think about what you could have done differently to avoid something similar happening again. One thing you know you can always take away from a traumatic experience is that you will never let it happen again. The idea behind crate training is to create a safe haven for your dog, for them to have a place that they can call their own and feel secure in. Once they have been crate trained properly your dog will see it as an area they can use when they need a break from the world or some time out. You can imagine how grateful they will be to have a place all their own, especially if they are a fearful, anxious dog. If something is scaring or worrying them then they have somewhere to escape to instead of being around or hearing whatever it is that was upsetting them. Since her previous incident Lola had been living life quite happily, going on trips to the park, the beach, to family’s houses. She didn’t even seem too put off by what had occurred. We did notice that she had stopped being as submissive when other dogs were around and was instead standing up for herself a little bit more. We, along with everyone else who saw this happen, thought that it was a good thing that she wasn’t getting pushed around anymore. Looking back I see that these were the early signs of a dog that had learned a new way to deal with a situation she was unsure of, but I nor anyone else realised how undesirable this behaviour would become. A dog that guards food and/or toys is exhibiting an instinctive behaviour. In the dog world they don't tend to just let another member of their pack borrow or take what they are currently enjoying. In a domesticated dog though this natural behaviour is unacceptable and can potentially cause injury. When Lola came to live with us, at about 4 months of age, I vividly remember first noticing the onset of one of her obsessive behaviours, shadow chasing. When she was a puppy and still learning right from wrong we kept her outside when we couldn’t watch her 100% of the time. After we had eaten our dinner though we would head outside to play a game, have a wrestle or just a cuddle. It was during one of these innocent interactions when my husband and I were sitting on the ground, so we could be at her level, that I recall Lola noticing, then pawing at and finally chasing any moving shadow. Who would have thought that these seemingly normal puppy behaviours of discovering new things, investigating these new things and interacting with these new things would turn into a full blown obsession in the months and years to followed.